Multiple System Atrophy or Multi System Atrophy (MSA) is a progressive neurological disorder. 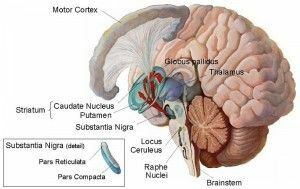 It is caused by the degeneration of neurons in certain areas of the brains, especially in the basal ganglia, the little brain (Cerebellum) and the brainstem. The cell degeneration causes problems with movement and balance. Also, autonomous (unconscious) functions of the body can be affected, for example control over the urinary bladder. It often begins between 50 and 60 years. MSA occurs in about 1 in 20 000 people. Insofar as is known, it is not hereditary. Nerve cells in the affected areas in the brains shrink and die (atrophy). This can be observed by an MRI scan. However, the diagnosis can only be stated with certainty by examining brain tissue under the microscope. This is done only after death. Physical examination is able to give clues that the problems probably are caused by MSA. If, after the patient's death, his brain tissue is examined under the microscope glial inclusions can be seen. These glial inclusions contain the protein α-synuclein. The presence of such inclusions in the portions of the brains which are responsible for movement, balance and automatic control will help confirm the diagnosis of MSA. For more information on this, see a page of The National Center for Biotechnology Information. It is not clear what makes certain nerve cells become damaged in MSA. MSA is not contagious. It also is not inherited, although it may be that the cells of certain individuals are more likely to get damaged than the cells of others. What initiates the damage is unclear. This is still being investigated. The symptoms of MSA differ from person to person. Fortunately MSA is pretty rare. In the Netherlands, an estimated 1,500 to 2,000 people have the disorder. It is equally common in men as in women and usually begins after the age of 50 years. There are two forms of MSA. For comprehensive information, see this PDF-document (in Dutch) by the Admiral de Ruyter Hospital in Zeeland, the Netherlands. Below the information in this document is displayed briefly. MSA-P: this form of MSA is also called Striato Nigral Degeneration (SND). The symptoms of SND are similar to those of Parkinson's disease. One difference is the location where nerve cells die first. In Parkinson's disease, first the dopamine producing cells in the black core (substantia nigra) degenerate, and in a later phase cells in the basal nuclei. Disorders of the autonomic nervous system, especially low blood pressure when standing and walking. MSA-C: This form of MSA is also referred to by the term OPCA (Olivo Ponto cerebellar atrophy). This disease affects the small brains (cerebellum) and the brainstem (Ponto). MSA-C causes uncoordinated movements (ataxia) by a disturbance in the small brains (cerebellum). MSA-C is not hereditary, but there is a hereditary form of ataxia. This condition is called ADCA (ADCA means autosomal dominant cerebellar ataxia). MSA-C often starts with insecure balance while moving and uncoordinated movements. During movement often tremor (trembling) occurs. This is different from Parkinson's disease. Herewith the tremor occurs at rest. Other symptoms of Parkinson's may occur. In an early stage of the disease often speech disorders arise, by which the voice becomes impure and soft. Parkinson's patients often have a tendency to tremble at rest, which in MSA patients rarely the case. In these patients, trembling occurs during movement. With Parkinson's disease there may be autonomic symptoms (impaired unconsciously ocurring functions), but at MSA the autonomic symptoms play a much larger role and usually these symptoms occur much earlier in the course of disease. With MSA, the intellectual functions remain mostly intact. Patients with MSA usually show a faster decline than patients with Parkinson. Usually the first symptom is a urinary bladder problem: increased urinary frequency, incomplete emptying of the bladder or inability to pass urine (retention). These problems are often attributed to the aging process or a condition of the prostate in men. In many men, this occurs in combination with an erection problem. Treatment for MSA involves a combination of medication, therapy and specialized tools. In the case of movement disorders often the same medication is used as in Parkinson's disease. For problems with blood pressure or bladder problems often regular medication can be prescribed.